Resource Hacker может применяться как для простого "выдергивания" иконок, музыки и прочего, находящегося в программном файле, так и, например, для модификации интерфейса программы, в том числе и его перевода на другой язык. 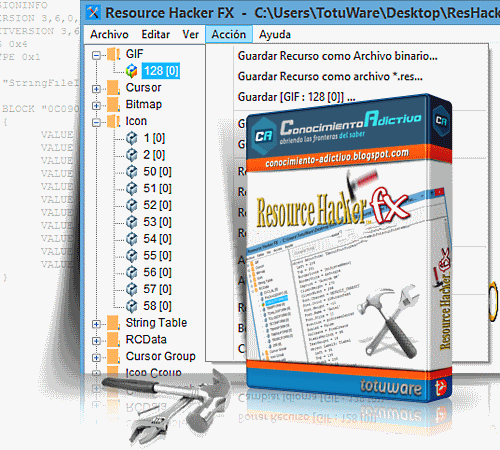 Resource Hacker is a freeware utility to view, modify, add, delete and extract resources in 32bit Windows executables. It incorporates an internal resource script compiler and decompiler and works on all 32 Bit Windows OS. ResHacker is a tool for modifying 32 bit applications, DLL, OCX and SCR files. You can "edit" applications by changing dialogs, changing or removing graphics and even removing certain application functionality. I was amazed of the things it can do. There are a lot of tutorials online about how to use this tool so I won't go into too much detail describing how it works. Instead I would like to emphasize what it can do. I first used this program for modifying the version info of my Windows Explorer. To do this I opened the "explorer.exe" file from the Windows installation directory. I was able to modify the version info making it say whatever I wanted. Another time I wanted to change the icons of an application which I used. No problem, ResHacker did the job perfectly. I realized that I could also modify bitmaps, menus, string tables, shortcut keys (they're called accelerators), version info and so on. ResHacker can be used to modify almost any file. Compressed executables are not fully editable and many times all you can edit is version information. Whenever you modify a file you do it on your own risk. You'll lose all right to support from the vendor associated with the modified application. Most times there won't be any problems after modifying with ResHacker (I never had any problems) but to be on the safe side you should test the modified application thoroughly.